Inkspire Me: Paper Pumpkin - What is it? Some of you have been asking "What is Paper Pumpkin?". I looked back on my posts to find my original post and would you believe I never really did a proper introduction to Paper Pumpkin? So allow me to do that now! Sweep away the mundane - your creativity carriage awaits!I’m Paper Pumpkin . . .I come to your door each month (a fully decked-out creativity carriage). I’ll help you to escape your life with some paper fun. I come in a sweet box, but you’ll really love what you find on the inside:All the stamps, ink, paper, and accessories to create pinable projects. 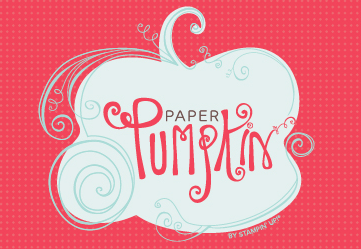 Create stuff like cards, journals, décor, and more!Paper Pumpkin by Stampin’ Up! is a new monthly kit program that anyone (even you) can enjoy! It’s easy to get started. Simply sign up for the program at www.mypaperpumpkin.com and click “Get It.” If you are my customer, please be sure to choose me as your demonstrator during the ordering process. Every month a new project kit arrives at your doorstep. Just think of the anticipation of creating a fun project to pin, showoff, and share with your friends and family-every month! Each month you’ll receive a unique, surprise kit with a project-cards, journals, décor, and more! Everything is color-coordinated, measured, and cut just for you! Each kit takes about 30 minutes to complete. A luscious, creativity escape. Stampin’ Up! will ship your Paper Pumpkin on or around the 15th of the month. You need to sign up for a kit by the 10th of the month to get that month’s kit. If you sign up on the 11th of the month, your first kit will come the next month. For example, if you sign up on May 10th, Stampin’ Up! will send your kit around May 15th. If you sign up on May 11th, they’ll send your first kit around June 15th. There’s no commitment, you can cancel your monthly Paper Pumpkin at anytime. You also have the option to skip a month should you wish. A: A demonstrator is a super cool creativity coach that sells Stampin' Up! products. We'll give you the option to choose a demonstrator when you sign up for a membership. You're definitely going to want one. But you can still join without selecting a demonstrator. A: Prepaid subscriptions provide an opportunity to purchase several months of Paper Pumpkin all at once. These orders can be placed on a customer, workshop, demonstrator, or online order. Plus they are commissionable and will qualify for hostess benefits. A: You and your customers can select a subscription for one, three, six, or 12 months. A: When the order is paid for and closed, the customer will receive an e-mail with a redemption code and instructions on how to redeem. The e-mail will guide them to www.mypaperpumpkin.com where they will enter their code. The system will recognize the number of months they've paid for. Be sure to instruct your customers to enter all their information on the site so when their prepaid subscription runs out, they can continue to receive Paper Pumpkin kits without interruption. Q: Can I buy a prepaid subscription with hostess benefits? A: Yes. A prepaid subscription can be added to either the free or half-priced hostess items. Q: Can I purchase any past kit? A: Yes. Click here to see a list of complete kits and refill kits that are available to order only while supplies last. Q: Can I download a list of available product? Q: How do I order these past Paper Pumpkin Kits? A: Call Stampin’ Up! at 1-800-STAMP UP (1-800-782-6787), and a Stampin’ Up! representative will take your order, Monday through Friday, 7 AM – 7 PM (MT). Q: Can I order these past Paper Pumpkin Kits online? A: Unfortunately, no. You must call Stampin’ Up! at the above number. Q: Do the past kit prices include shipping? A: No. Shipping is an additional charge. A: Shipping is $9.95 or 10 percent of your order, whichever is greater. Q: Will other past kits or refill kits be offered? A: There is no guarantee that we will sell additional past kits or refill kits again. Q: Can I purchase past kits if I used to be a Paper Pumpkin member, but I’m not right now? A: No. You must be a current Paper Pumpkin member to purchase these past kits. Q: If I sign up for a Paper Pumpkin membership today, will I be eligible to purchase past kits and refills? A: Yes! If you sign up for a Paper Pumpkin membership today, you can purchase any of the selection of past kits and refills offered above, while supplies last.